By Kacper Pawlik and Mateusz Mucha. The proportion calculator helps compute identical proportions. Before we can use the calculator, it's important to understand what a proportion is and how to solve proportions by hand. To help you understand these topics we present to you a proportion definition and the concept of the constant of proportionality. After reading this text, you will be able to tell whether two parameters are directly proportional or inversely proportional. Finally, we talk about some real-life proportion examples. You will see that proportional relationships are present everywhere in the world that surrounds us. Scientists use the law of multiple proportions while performing chemical reactions and accountants (or basically any taxpayer) should be familiar with the proportional tax definition to know how much money they have to pay to the state. A proportion is a relationship between two quantities. It displays what portion of one part is contained in the whole. The result is typically seen as a fraction, but can also be represented with a colon, or as a decimal or percent. If your preference is in the percent-based display, we encourage you to visit our percentage calculator, it might also be a better choice for solving proportions with 100 as the denominator. It still follows the proportion definition but also enables you, for example, to calculate what percent of your birthday cake was eaten by your uncle 😊. Just as a fraction is made up of two parts, a numerator and a denominator, the same holds true for a proportion. The upper number of proportion is the numerator, and the bottom part of the proportion is the denominator. To illustrate this, let's look at an example. Suppose, that there is a cake cut into 12 slices. 5 of the 12 slices have been eaten (by that cheeky uncle). You want to know the proportion of slices remaining compared to the entire cake. You have 12-5 = 7 slices remaining, so the proportion is 7/12. If you wish to rewrite this proportion using a colon, you could write it as 7:12. 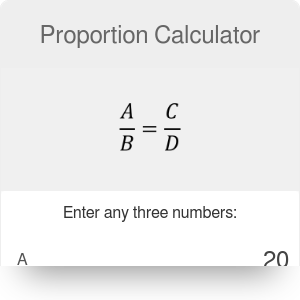 Note that this proportion calculator will not represent the proportion in the latter form. What is the process if we want to simplify or scale the proportion up to a larger, yet equivalent proportion? The next section on how to solve proportions explains this process. where c is the constant of proportionality, while x and y are the two variables in an inversely proportional relationship. Where v is the velocity, s is the distance, and t stands for time. Looks familiar, doesn't it? Yes, it is the same formula as for the constant of proportionality of two directly proportional variables. As this relationship is (by proportion definition) constant, then if we change one variable, the second one will also have to change. This way, by knowing our speed, we can also calculate the distance we will cover in 1 minute, 1 hour, 1 day, or any other period. With the value of time gradually increasing, the distance covered will also rise proportionally. The other way around, when the distance becomes shorter, then the time value will also have to decrease to maintain the constant ratio. Other popular examples of constants of proportionality of two directly proportional variables are concentration and density. In both of these examples the directly proportional variables are mass and volume. This equation seems to be more similar to the formula of the constant of proportionality of two inversely proportional variables, doesn't it? If the distance (constant) stays the same, then the change of velocity or time will cause the change of the other variable. As we are talking about an inversely proportional relationship, then an increase in velocity leads to a reduction of travel time. We observe this process in real life. A car traveling with higher speed will reach its destination in a shorter period. In turn, if we want to prolong the travel time (e.g., to admire the countryside, or to save on gas), then the velocity will have to decrease. The constant ratio has to be preserved. In the last paragraphs of this text you will find some other real-life proportion examples and instructions on how to solve them. Set up both fractions, labeling the missing part with any variable of your choice. Put an equal sign between the two ratios. Note that ratio and proportion are the same things. Isolate the variable by using cross multiplication, which is multiplying the denominator of one proportion by the numerator of the other and vice versa. Use the proportion calculator to check your answer. Now you know everything about solving proportions. We urge you to use the proportion calculator if you are solving proportions with larger numbers or those involving decimals. The proportions can be used to adjust the amount of ingredients in a recipe for a larger number of guests. If you want to make pancakes, our pancake recipe calculator will tell you exactly what you have to prepare for a certain number of people. The golden ratio calculator is handy to compute this ratio. The golden ratio can be seen in architecture and in general with shapes, such as the rectangle. A rectangle is golden if, with the given width w = a and length l = a + b, the ratio (a+b)/a = a/b yields the value of approximately 1.618. The golden ratio is the limit of the ratios of consecutive Fibonacci numbers and a non-terminating decimal. Thus we use the approximate value of 1.618. The golden rectangle calculator will compute the length and width that achieves the golden rectangle. In geometry, the proportion calculator comes in handy when working with similar polygons. By definition, two polygons are said to be similar if their sides are in proportion. The most common application of this is with triangles. The law of sines for triangles is based on a fact that there is a proportional relationship between sides and angles of a triangle. Less scientifically speaking, if we divide masses of atoms of different elements forming a single particle (e.g., CO₂ – carbon dioxide), we always receive a constant ratio specific for this particle. The result will consist very often of small numbers. First, we have to count the numbers of atoms of particular elements forming the sulfuric acid. We have 2 atoms of hydrogen H, 1 atom of sulfur S, and 4 atoms of oxygen O.
Secondly, we need to calculate the total mass of atoms of each element. Single hydrogen atom weighs 1 u (u stands for atomic mass unit), one atom of oxygen weighs 16 u, and one atom of sulfur has a mass of 32 u. There is only one atom of sulfur in this particle, so the weight of sulfur is equal to 32 u. And that’s it! We have received a ratio of small numbers for a particle of sulfuric acid. Thanks to this knowledge we can tell that if we have 1 g (or any any other unit of mass) of hydrogen we need to add 16 g of sulfur and 32 g of oxygen to be sure that all atoms of each element will take part in the reaction and that there will not be any leftovers. We have a task for you! Check (by using our proportions calculator) how many grams of hydrogen and oxygen can react fully with 352 grams of sulfur creating sulfuric acid (you can find the answer at the end of this text). There are some other examples of proportional relationships in chemistry. The molarity shows the relationship between a number of moles of a certain solute (a dissolved substance) and a volume of solution. Some amateur chemists may be interested in the ABV (alcohol by volume) representing the relation between the volume of alcohol and the total volume of a drink. After a quick visit to the world of chemistry, now it is time to see whether we can find our beloved proportions in finances. In fact, we can! Some of the taxes that we pay are proportional taxes. It means that the tax rate is fixed and everyone has to pay the same percentage of their income (or any other value undergoing proportional taxation). Although the amount of tax paid by the person Y is greater than the tax of person X, it is the same part of their income as a whole, namely 15/100 or 15%. Another type of tax (probably the most popular one) is a progressive tax. It is similar to the proportional tax as you also have to pay a certain percent of your income. The difference is that this percentage (or tax rate) changes with an increase of income. In progressive tax, there are specific tax rates for certain ranges of income value. For example, people of income under 100,000$ may have to pay 20% of their earnings, while people with an income over 100,000$ may have a tax rate of 25%. If you are more interested in the topic of taxes, visit our sales tax calculator. You will see what proportion of the total price of a product we spend on sales tax. Some purchased goods (especially services) require tipping. With our tip calculator you will no longer wonder how much you should tip! Answer to the question: By the law of multiple proportions, 352 grams of sulfur can react fully with 22 grams of hydrogen and 704 grams of oxygen creating sulfuric acid. Kacper Pawlik and Mateusz Mucha. Proportion Calculator can be embedded on your website to enrich the content you wrote and make it easier for your visitors to understand your message.